My hair is longer was longer until I cut it yesterday, and blonder. I am slightly tanner. Ever so slightly. I love cooking. I love it so much, it borders on obsession. Yet I have very little tolerance for hearing people complain about most anything. I can give technical support via email, facebook, phone, and text message. I hardly flinch when I see a cockroach or a mouse. Powdered milk, fish, beans and rice have become dietary staples. I consider chicken and cheese to be luxury items. I’m delighted that I have no idea where I’ll be or what I’ll be doing in 5 years. A tiny surprise showed up on our front porch a few nights ago. 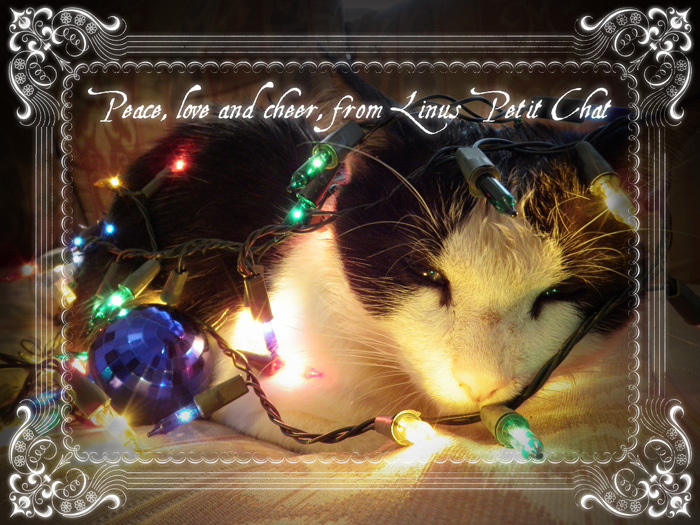 We think she looks just like Linus and have concluded that she must be his offspring. 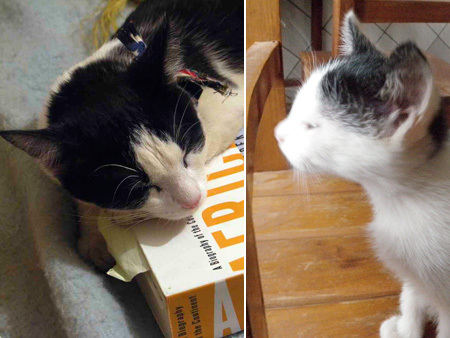 Before we got him fixed, he was going out at night and surely impregnating the neighbor’s cats. I couldn’t get a great picture of her because kittens don’t sit still, but what do you think? Father-daughter resemblance? He didn’t take too well to fatherhood. Another volunteer who was here wanted to take her home, but the kitten had to stay here for the weekend. Linus was not pleased. He growled and hissed at the tiny kitten and spent most of the weekend hiding and pouting in a box on top of my closet. Now the kitten has gone home with her new mom and Linus has come down from his box, reclaimed his territory, and asserted his dominance by leaving a decapitated mouse in the kitchen doorway for me. I don’t think he’ll be getting a father’s day card. Last weekend we wanted some chicken nuggets. 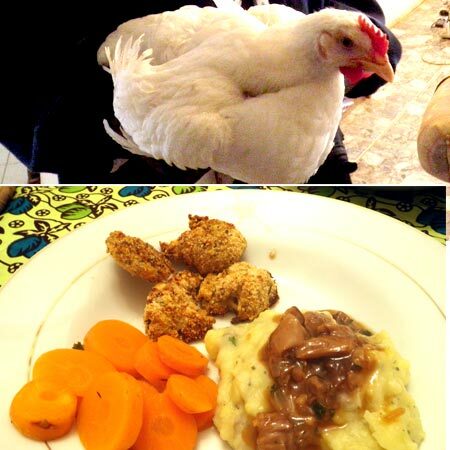 So step one in making chicken nuggets in Cameroon is to buy a live chicken. I didn’t want to spend too much time with it while it was alive, for fear of becoming attached. So I got my friend to buy it for me, and he also did the killing and cleaning of the chicken for me. As a side note, while the chicken was in my kitchen, I brought Linus in there to see what he’d do with a live chicken. He was afraid of it. After the chicken was dead and de-feathered, I set about trying to cut nugget sized pieces of meat from this thing. See, the original recipe calls for buying 3 boneless, skinless chicken breasts. Well we do what we can here. After wrestling with this chicken carcass for an hour or so, I had enough pieces to make a decent meal of baked chicken nuggets, complimented by mashed potatoes with mushroom gravy (it’s mushroom season!) and steamed carrots. Chickens are expensive, so this isn’t something I’m going to be making very often. But it was a nice treat to have some nuggets. And to be as resourceful as possible, I first used all of the leftover chicken bones and feet to make chicken stock, and then fed them to Linus. Remove chicken meat from bones and cut nto nugget-sized pieces. In a medium bowl, mix together the bread crumbs, cheese, salt, thyme and basil. Mix well. Put eggs into a bowl for dipping. Dip chicken pieces into the egg first, then coat with the breadcrumb mixture. Place well coated chicken pieces on a lightly greased cookie sheet in a single layer, and bake in the preheated oven for 20 minutes. Bamenda is really becoming a developed city. You know how I know? A cake and ice cream store opened up in our quartier! The maker of the cakes, Relindis is my new best friend. The first day she was open, she just had a few small cakes in her little glass case and a newly painted sign hanging from the awning outside. So I bought one of the cakes and chatted with her a bit. A week later she got electricity in her shop and brought in a soft-serve ice cream machine and a popcorn machine! There’s decent soft-serve in Bamenda, but hers is by far the best I’ve had anywhere, light and creamy with a hint of lemon flavor. Now she’s making more varieties of cakes, sometimes with colored frosting in pretty designs, and she can make custom cakes for any special occasion. She told me that she’s working at the cake shop for a year while she saves money to go back to school. 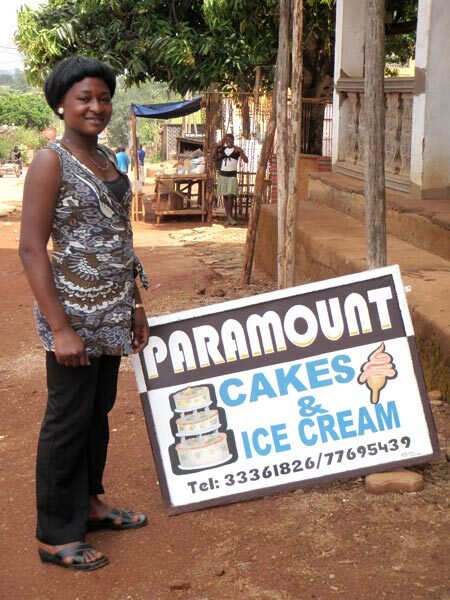 Her family wanted her to move to the village after her father died, but she wanted to pursue her education in fine arts, so she is in Bamenda on her own. I pass by her shop just about every day, so I usually stop in and chat and of course, have an ice cream cone for 100 CFA (about 20 cents). On an unrelated note, I’m going to Nigeria tomorrow with another volunteer, then to Benin to visit a PCV we met in DC before leaving for Cameroon. With any luck we’ll get cast in a Nigerian film while we’re there. After I left for Nigeria, the Bamenda city council removed all shipping containers from the city. The cakes and ice cream shop was one of the many small shops that was in a shipping container, so her store was removed! She has temporarily set up on the porch of an abandoned half-constructed building next door. She says they are preparing a new building that she will be able to move into soon. For now, she’s making do with the space she has. Mexican food is good. I’m challenging myself to make everything I crave and miss from the land of infinite variety and food availability. I think almost everything can be accomplished with somewhere between 4 and 12 times the time and effort, depending on the complexity and the level of authenticity desired. Tuesday I made an all day all-you-can-eat Mexican feast which included breakfast quesadillas with mexican rice and refried beans, plus tacos, corn chips and guacamole, and enchiladas. I think I finally finished digesting it this morning. Here are some of the other things I wanted to eat recently and subsequently made: chocolate cake with vanilla and chocolate frosting, potato pancakes and the sour cream and applesauce that go with them, 3 kinds of hot pockets (ham and cheese with caramelized onions, pizza, and shepherd’s pie), corn dogs, pad thai, and those fried wontons from Mick O’Shea’s stuffed with mashed potatoes and cheese (had to leave out the bacon–that’s only found in Yaoundé). Despite my successes in elaborate recreations of delights from the developed world, there are a few cravings I can’t satisfy with any efforts in home cooking, among them are boxed macaroni and cheese, good pizza, and junior mints. For Christmas Eve I bought a coconut from the market and made Coquito, eggnog made with coconut cream. It was tasty. I only used about 1/4 of the coconut though. What should I do with the rest of it? We have a camera again so now we can share photos again. Studies show that blog posts sans photos are 23% less exciting. I just made that statistic up. A couple weeks ago I was in Yaounde taking the Foreign Service Officers Test. 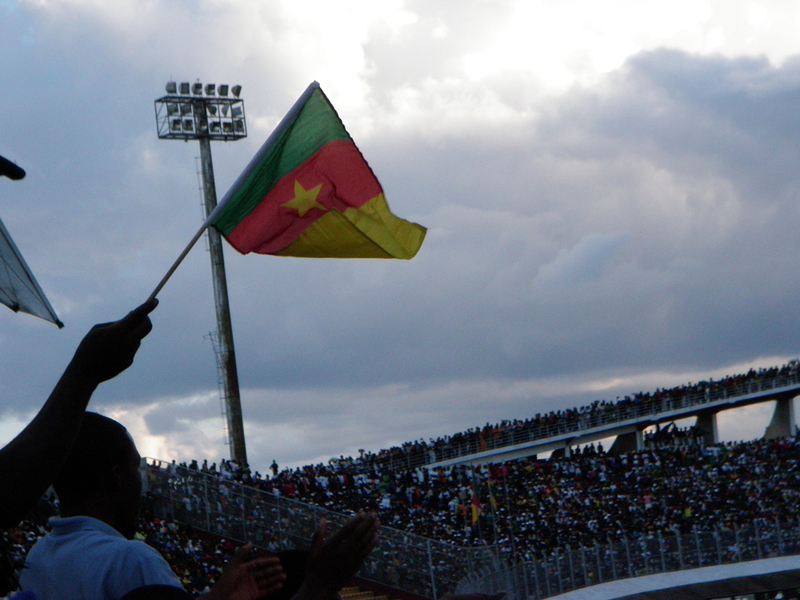 The same weekend, Cameroon’s stellar football team, the Indomitable Lions played Togo in an exciting match that we attended with a group of other volunteers. It was the first professional football match I had ever attended. The stadium was packed. The seats are concrete steps, there is no electronic scoreboard, no announcer giving the play by play in between bits of base-heavy pop music. 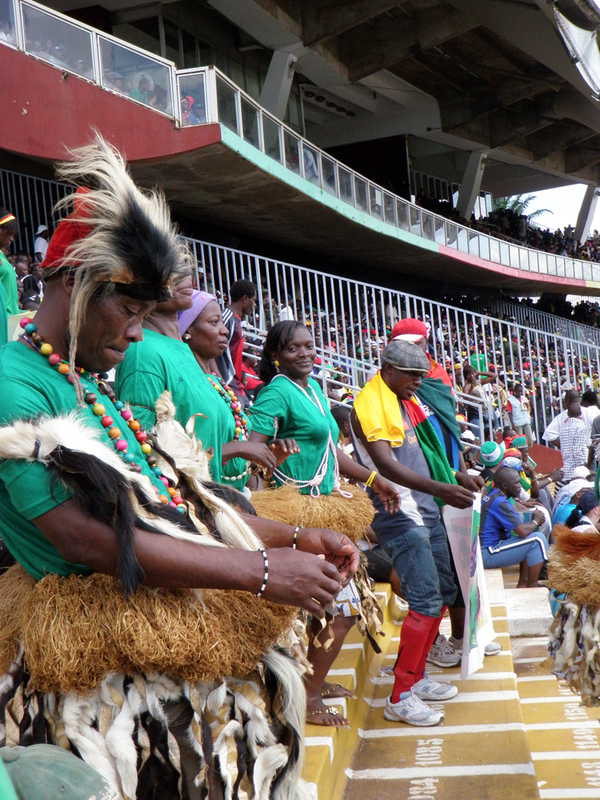 Instead, the energy of the crowd was intensified by Cameroonians playing traditional drums and dancing. Venders sold cookies, beer and soda, and there was a guy who served up a delicious helping of peanuts and popcorn in a paper cone for 100 francs (~20 cents). 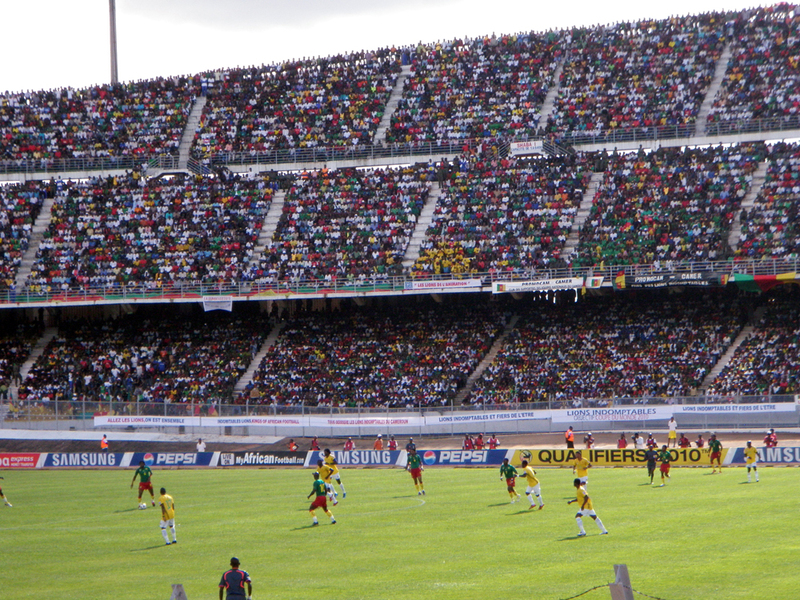 The Lions dominated Togo, winning the match 3-0. We are doing lots of transitioning these days. Transitioning from our old job to our new job, from our old house to our new house, from living in a francophone region to living in an anglophone region, and from having a store with good cheese be 45 minutes away, to being only 15 minutes away. Training of the newest Education and Small Enterprise Development volunteers is over, and they all swore in at the end of August. Now we’re getting ready for the arrival of new Agroforestry and Health volunteers. We start our new job next week. We are working with the delegation in the Northwest to train primary school teachers how to teach computer science. We moved into our new house last week. It is also the new transit house for the Northwest, so there are two rooms filled with bunk beds and more comfortable couches that we inherited from the old transit house, and will nicely accommodate any volunteers that are traveling through the area and need to spend the night. My new house also has a big kitchen and I like it a lot. I made chicken pot pie for myself and 7 other volunteers the other day. I also tried to make these cookies that ended up being cake. It was good cake though. 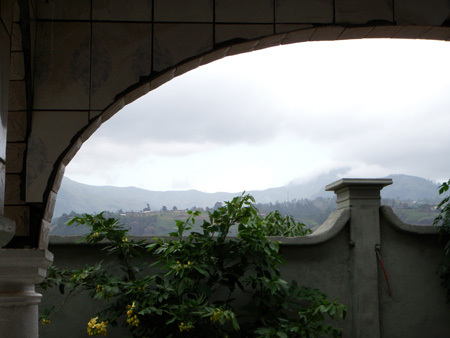 The house also has fun things like a fireplace (that doesn’t work of course), a lovely view of the surrounding mountains and waterfalls (which I can’t take photos of yet), and they are currently installing mosquito netting on all of the windows! Linus, however, was traumatized by the move and spends 18 hours a day hiding in the bathroom. In April another volunteer and I founded Peace Corps Cameroon’s newest volunteer committee, the ICT Committee. We now have 7 members and are working on rock star projects like Peace Corps Cameroon’s country website which will be launched bientot. It will be super-amazing-fantastic. I’m happy to report that Gabe and I are both parasite-free after our mid-service medical exams. After a few weeks vacationing in the decadent land of available cheese and hot showers (Europe) with our amazing friends and family who met us halfway around the world to bring me Junior Mints (among other things), we are back in Cameroon, helping train the new volunteers who swear in at the end of August. Sincere apologies for the run-on sentence. They are a good group–sharp and motivated. Last week model school opened and the trainees observed us teach just like we observed the volunteers and trainers last year. Now this week they began teaching real Cameroonian schoolchildren for the first time. Remember our first day teaching Model School last year? I do. In other news, we may not have photos on the blog for a while…since our camera was stolen in Paris. Also the vegetable soup I made today is a touch too spicy. Next time I will use less red pepper. 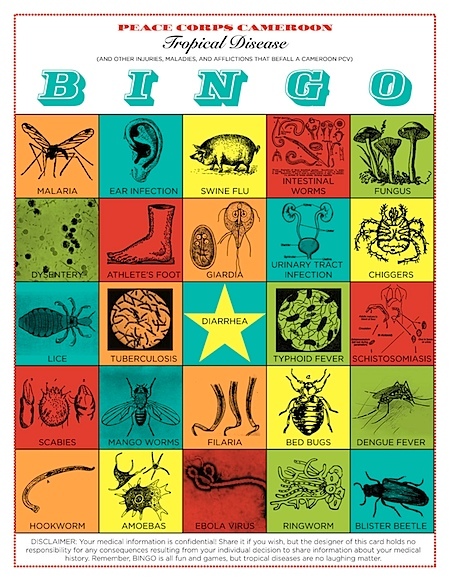 Peace Corps Cameroon Tropical Disease Bingo! We’re in Yaounde this week for Mid-Service Medical, during which they give every volunteer a physical and test our bodily fluids to see if we’ve acquired any fun new tropical diseases. To commemorate the occasion of being in Cameroon for a whole year, I made an official Peace Corps Cameroon Tropical Disease Bingo Card. We haven’t yet decided what the prize for the winner will be. Ideas? Those of us who are helping with training this summer/rainy season are in Yaounde this week and next for the TDW (Training Design Workshop) and TOT (Training of Trainers). Gabe and I are here designing the technical training sessions for the 5 incoming computer literacy trainees as well as working with the science and TEFL volunteers and trainers to design, organize and improve PST (Pre-Service Training). A lot goes into organizing the 11-week-long program. We decide, based on our own experience last year and input from other trainers and volunteers, what sessions to change, remove or add, and in what order to have them. But let’s remember that the Peace Corps is a U.S. Government organization so the way we do everything is handed down from the air-conditioned offices in Washington D.C. all the way to our conference room in the Peace Corps compound in Yaounde, Cameroon. In an effort to standardize training worldwide, the Peace Corps wants each country to have 2-3 core competencies and sector competencies. These are the fundamental things that the trainees will have learned by the end of training. Then once we have the competencies, we write KSA’s for each of them (Knowledge, Skills and Attitudes required to achieve each competency). Then we break everything into technical training sessions, and for each session we have learning objectives. Now each of these learning objectives has to be SMART (Specific, Measurable, Attainable, Realistic, and Time-Bound) and include the Kirkpatrick Evaluation Model (clearly describe the performer, performance, condition, and standard). Semantics are paramount. Sound fun? It’s not that fun. But it has to be done and as long as we keep the big picture in mind–effectively training these new arrivals–we can make it through the tedious moments (like when we spend 15 minutes debating between the words “discuss” “identify” or “list” as the active verb in the learning objective. In-between the semantic debates and frustrating arguments over logistical issues with the training calendar, we have time to relax, watch movies, and catch up with other volunteers we haven’t seen in a while. A few of us are cooking dinners for everyone most nights and I’m enjoying spending time with them in the kitchen (where we belong so Gabe says (he’s joking (allegedly))). But one of my favorite things of all is watching our APCD with a flip-chart. It’s a graceful dance of marker and paper that can only be described as pure magic. 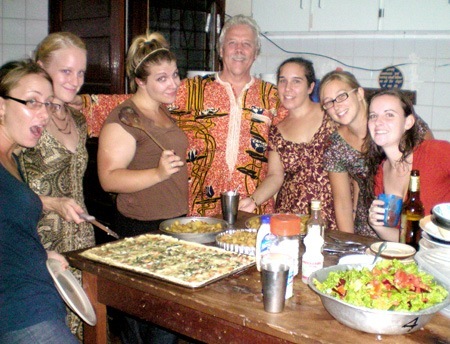 This is a blog written by Peace Corps volunteer Thryn who served in Cameroon. 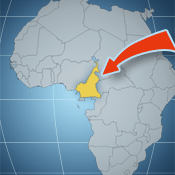 click on the map to learn more about Cameroon. This blog is not associated in any way with the Peace Corps, and the opinions expressed here do not reflect the opinions of the Peace Corps. It's just the personal blog of Thryn and Gabe.